Reflective Jacket is used for protection against accidents caused by low visibility conditions such as rain, fog, smoke, dust and dim light. 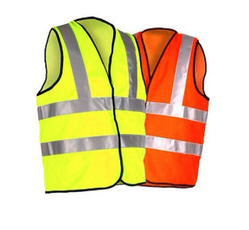 This traffic safety vests gives ultimate quality high visibility and are available in striking colours. They are widely used in construction, mining and traffic. We are long-time established manufacturer, distributor, importer and exporter of Reflective Jackets. 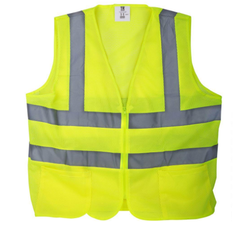 Our Reflective Safety Vest is being exported to global regions like of Middle East, Africa, South Asia, Latin America, Europe, Bangladesh, Bhutan, Nepal, Sri Lanka and many more. Our Highly Visible Jackets follows industrial norms like Indian Standards, ANSI, CE, FDA, etc. depending on the product. We have over two decades of vast industrial knowledge and experience in producing superior quality Polyester Vest. Our engineers and technical team also provide customised designs Safety Vest With Reflective Tapes as per customer requirements and applications. The basic materials used in manufacturing Reflective Vests are well tested by our testing team to ensure its safety. Advanced techniques are used to produce Safety Vests with precision. Looking for Reflective Jacket ?